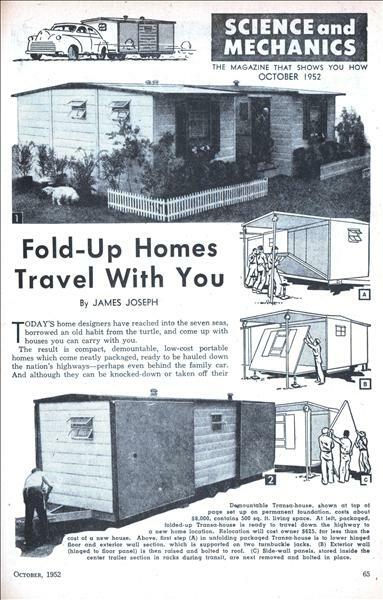 By JAMES JOSEPH TODAY'S home designers have reached into the seven seas, borrowed an old habit from the turtle, and come up with houses you can carry with you. 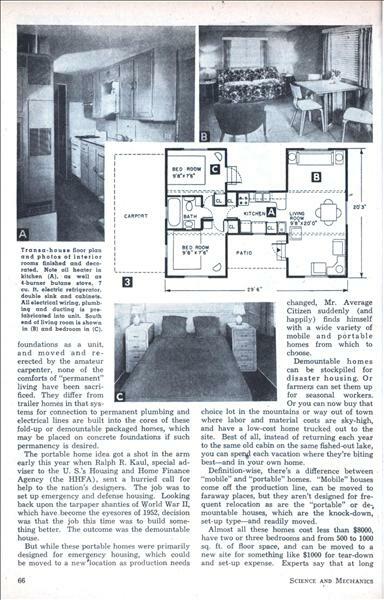 The result is compact, demountable, low-cost portable homes which come neatly packaged, ready to be hauled down the nation's highways—perhaps even behind the family car. 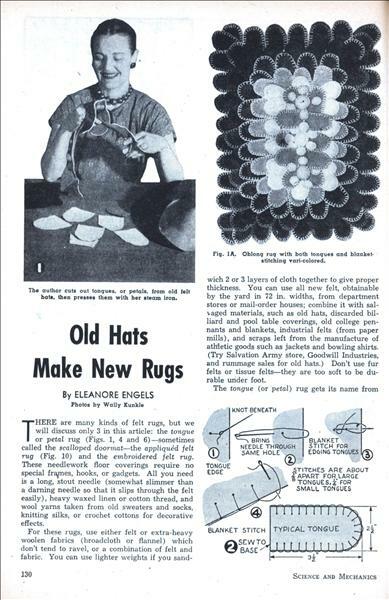 By ELEANORE ENGELS Photos by Wally Kunkle THERE are many kinds of felt rugs, but we will discuss only 3 in this article: the tongue or petal rug (Figs. 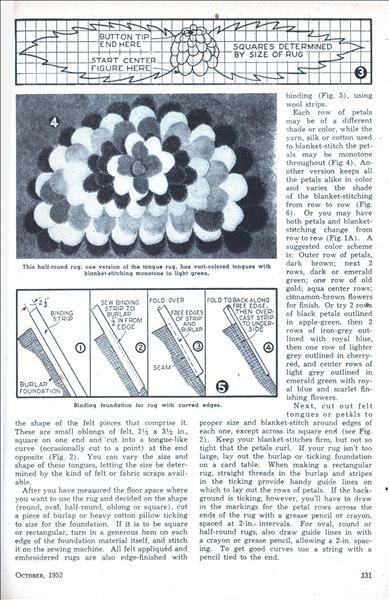 1, 4 and 6)—sometimes called the scalloped doormat—the appliqued felt rug (Fig. 10) and the embroidered felt rug. These needlework floor coverings require no special frames, hooks, or gadgets. 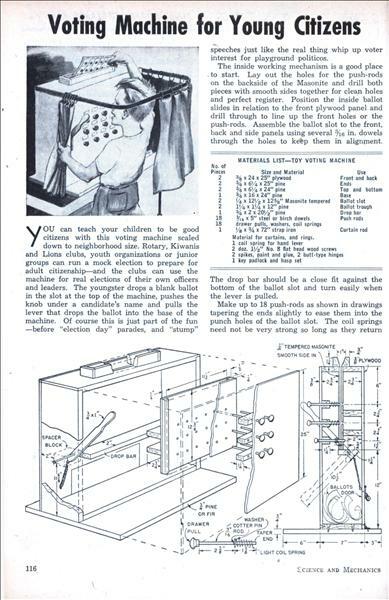 All you need is a long, stout needle (somewhat slimmer than a darning needle so that it slips through the felt easily), heavy waxed linen or cotton thread, and wool yarns taken from old sweaters and socks, knitting silks, or crochet cottons for decorative effects. 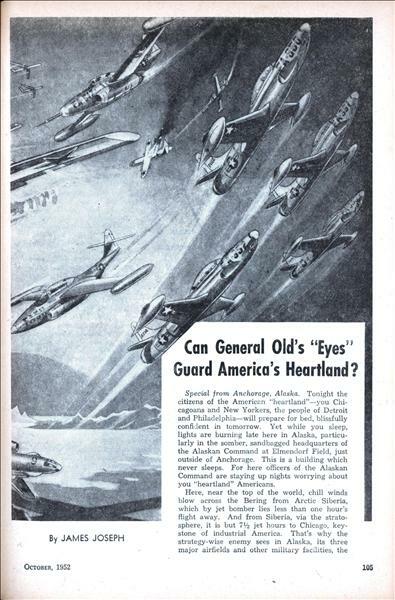 Can General Old's "Eyes" Guard America's Heartland? By JAMES JOSEPH Special from Anchorage, Alaska. Tonight the citizens of the American "heartland"—you Chicagoans and New Yorkers, the people of Detroit and Philadelphia—will prepare for bed, blissfully confident in tomorrow. Yet while you sleep, lights are burning late here in Alaska, particularly in the somber, sandbagged headquarters of the Alaskan Command at Elmendorf Field, just outside of Anchorage. This is a building which never sleeps. 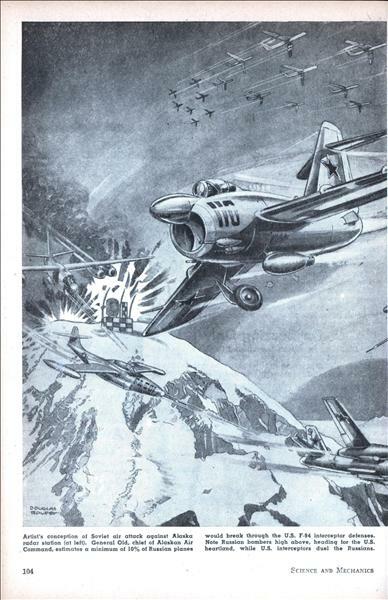 For here officers of the Alaskan Command are staying up nights worrying about you "heartland" Americans. 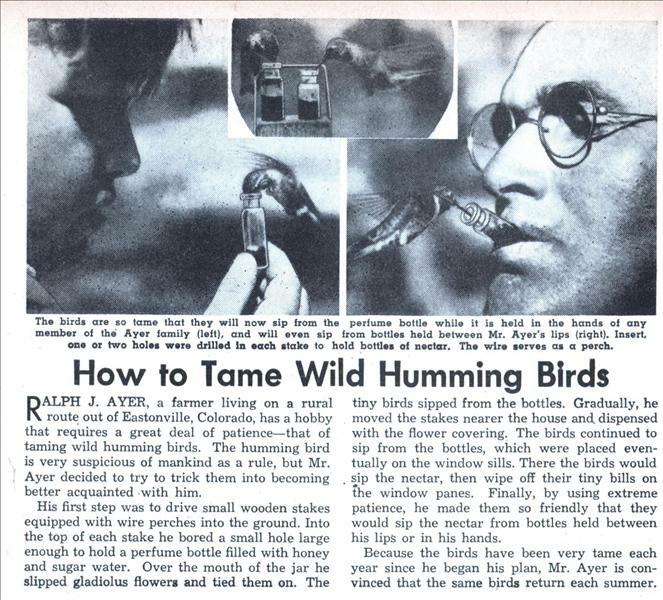 By DOUGLAS J. INGELLS DO YOU know how to build a secret ray gun for 2c? 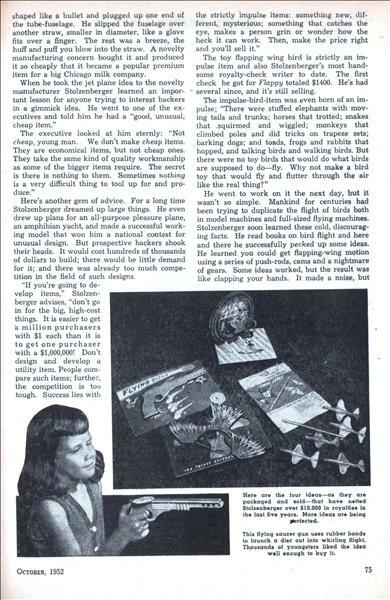 Can you design, develop and produce a treasure-seeker or mine detector that will cost only a nickel? Or build a radar or television set that sells for a dime? 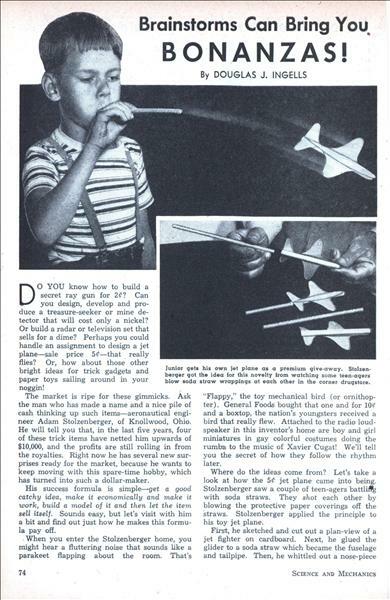 Perhaps you could handle an assignment to design a jet plane—sale price 5c—that really flies? 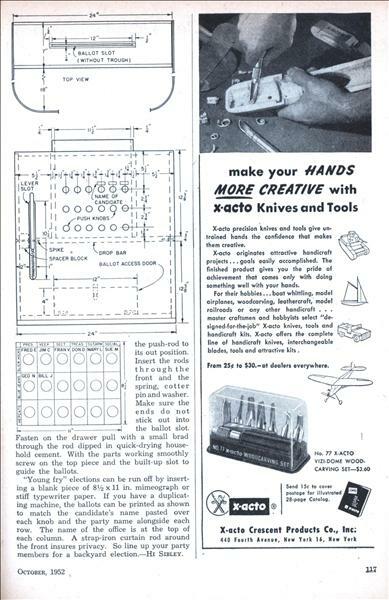 Or, how about those other bright ideas for trick gadgets and paper toys sailing around in your noggin! YEARS ago, O.R. 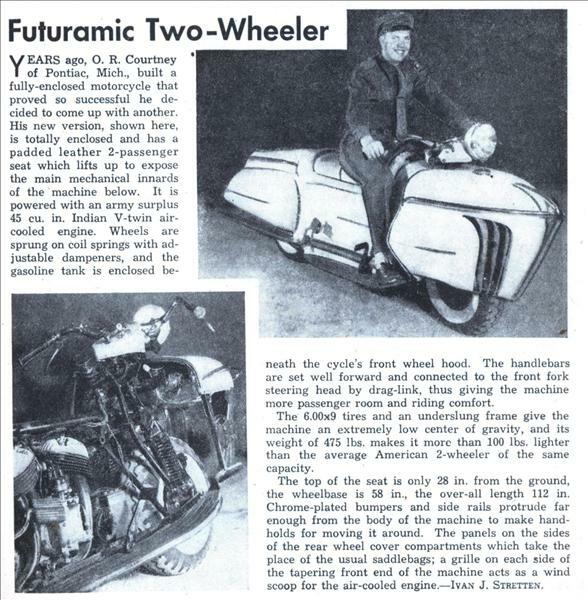 Courtney of Pontiac, Mich., built a fully-enclosed motorcycle that proved so successful he decided to come up with another. 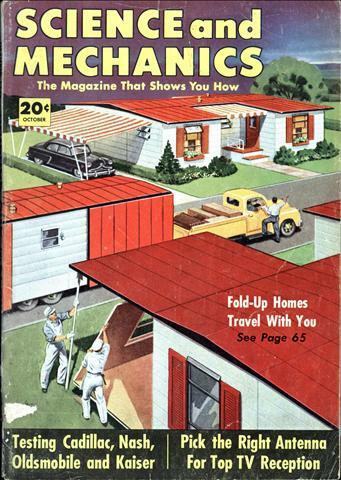 His new version, shown here, is totally enclosed and has a padded leather 2-passenger seat which lifts up to expose the main mechanical innards of the machine below. 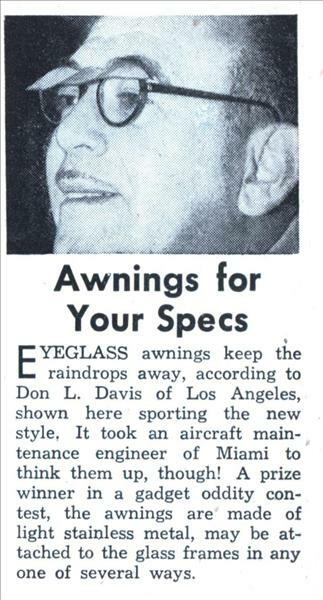 It is powered with an army surplus 45 cu. in. Indian V-twin air-cooled engine. Wheels are sprung on coil springs with adjustable dampeners, and the gasoline tank is enclosed beneath the cycle's front wheel hood. 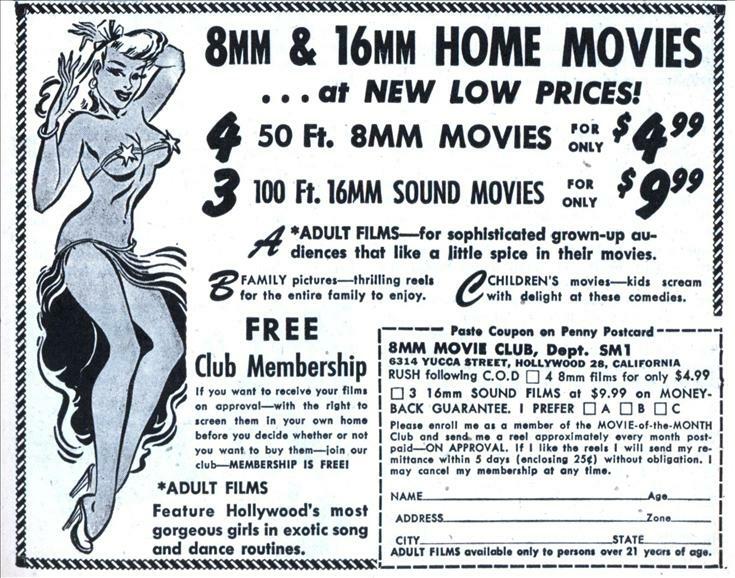 8MM & 16MM home movies ...at NEW LOW PRICES! 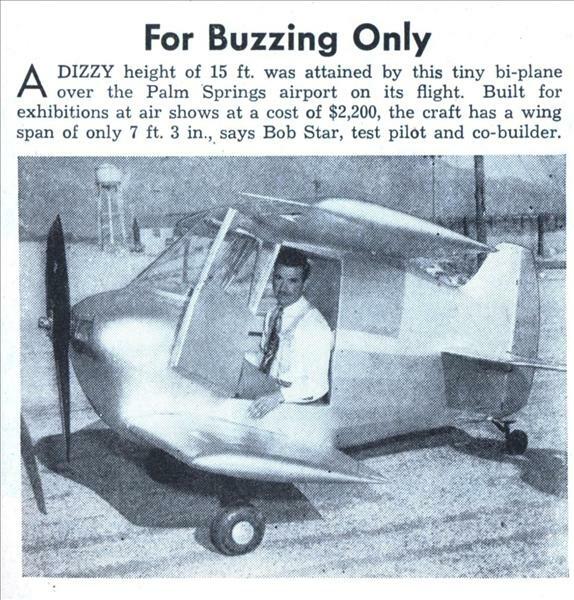 For Buzzing Only A DIZZY height of 15 ft. was attained by this tiny bi-plane over the Palm Springs airport on its flight. Built for exhibitions at air shows at a cost of $2,200, the craft has a wing span of only 7 ft. 3 in., says Bob Star, test pilot and co-builder.